So another anniversary has rolled around. It is now two years since I started out on my hike of over 1000k, on The CAMINO DE SANTIAGO, starting in the south of France, crossing the Pyrenees mountain range, and across Spain to the coast. I’m still quite amazed that I did it without hiccup. There were no aches, pains or blisters. I probably did over train before leaving, but I felt it was worth it, as I passed people on the side of the road, day after day, shoes and socks off, and often crying. There are just so many memories but on the anniversary of Day 2, I’d like to share this memory. I never, ever take selfies, but felt that at this time, it was entirely appropriate. 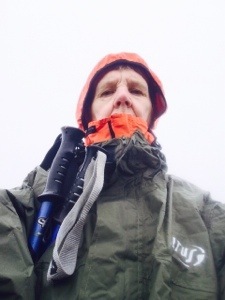 I had reached the top of the pyrenees, after hiking in wind, rain, sleet and light snow. Early in the day when setting out, I was sure I wouldn’t make it to the top. I had actually thought about plan B, in case I had to turn back. It seems silly now, but I didn’t have confidence in my ability, sure that my knees or back would give way, or that I just wouldn’t be fit enough. I started off slowly, but soon got into a rhythm, and then the nasty weather came. I had bought an Altus Rain Jacket in St. Jean Pied du Port on the night before starting the Camino. It had cost more than I would normally have paid for a rain jacket, but as the rain became heavier and I trudged up that mountain, I was so pleased that I did so, and very quickly threw on the, not very attractive, waterproof coat, which covered me from neck to ankles, also covering my pack. I stayed toasty dry and warm all day, and it is to this that I owe the success of that day’s walk. When reaching the top, I was extremely elated and in a mad moment, took the dreadful selfie. I don’t care that the photo is dreadful. I love this photo. It speaks to me of everything that happened that day. I remember it all as though it was yesterday. I remember being just so happy to have made it to the top. I remember how freezing cold, windy and wet it was at the top. 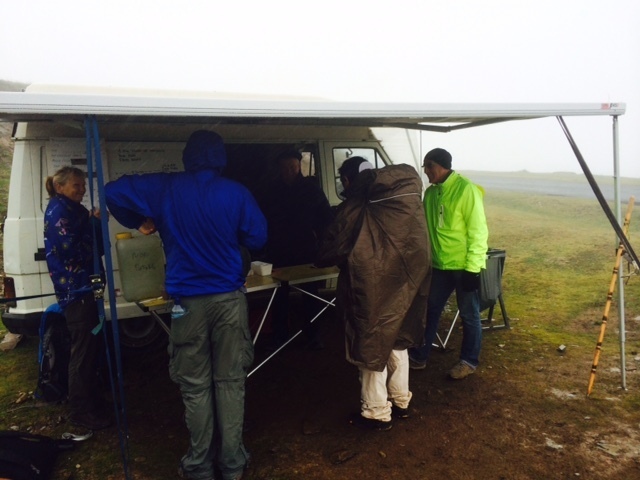 I remember the caravan, almost at the top, that was selling hot chocolate. Quite ordinary hot chocolate, but on that day, almost at the top of the Pyrenees, sachet hot chocolate never tasted so good. This day was the best day of my life in fitness. Looking at the photo of me, bracing against the bad weather, still makes me feel very euphoric. And I must say, it makes me yearn to go back to the south of France and do it all again. Memories! You are a fitness inspiration! I’m in awe of your accomplishments.